Diess can continue to travel the world freely without fear of being arrested in connection with the U.S.'s diesel-cheating investigation, the report said. 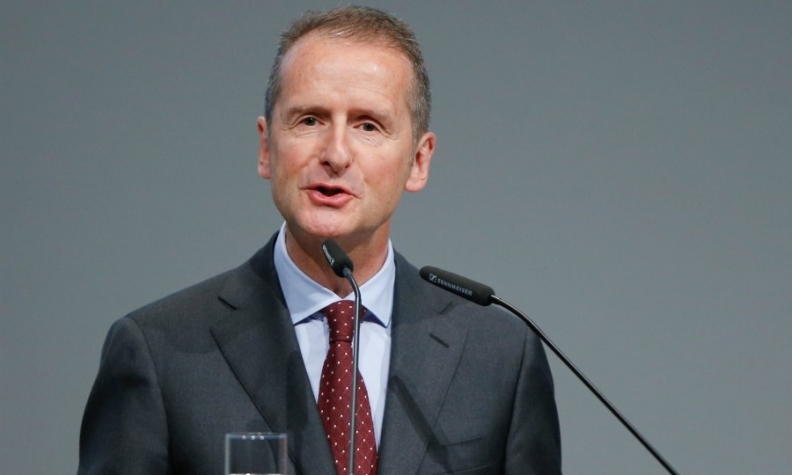 WASHINGTON/FRANKFURT -- Not long after U.S. authorities filed sealed charges against Volkswagen Group's former chief executive officer Martin Winterkorn, they granted the new CEO, Herbert Diess, a rare safe-passage deal, sources say. The Justice Department agreement allows Diess, who was promoted last month to lead the 12-brand group that includes Audi, Bentley and Porsche, to travel the world freely without fear of being arrested in connection with the U.S.'s diesel-cheating investigation, according to two people familiar with the matter. Diess also received a spoken assurance that he would be given advance notice should prosecutors seek to charge him in its emissions probe, said the people, who asked not to be identified because the deal is confidential. Diess, who joined the automaker a couple months before the scandal became public in September 2015, isn't accused of wrongdoing. The agreement essentially makes it possible for Diess to effectively run the sprawling 12-brand behemoth, which has 120 factories spread across the world. As CEO, one of his primary tasks will be hopping around the globe to represent the automaker at major events such as auto shows, plant openings and new model releases. The deal was approved after the former CEO, Martin Winterkorn, who won't enjoy the same freedom of movement, was indicted under seal in March. The charges against him were made public on May 3. Former prosecutors and criminal defense lawyers described such a deal as uncommon -- implying, possibly, that the U.S. believes it won't charge Diess, or that he may be providing useful information in the ongoing investigation. The Justice Department agreement also suggests that Diess has some concern about potential scrutiny by U.S. authorities, or at least wanted extra insurance against being detained during his frequent travels leading a global company. Volkswagen and the U.S. Department of Justice declined to comment when asked about the special arrangement for Diess. Diess has spent more than two decades in the German auto business, including at Robert Bosch and BMW. As a fresh recruit at VW, Diess participated in a routine "damage table" meeting on July 27, 2015, in Wolfsburg, where emissions irregularities in the U.S. were explained to senior managers, according to a 2016 company statement. That meeting was a key moment in the conspiracy -- one where Winterkorn "approved the continued concealment of the cheating software from U.S. regulators," U.S. prosecutors said in the unsealed indictment against the former CEO. Because Diess attended that meeting, he would know what was said by Winterkorn and others when they were together in the room. Diess is already under investigation in Germany -- along with Winterkorn -- for possible market manipulation for not going public sooner about the scandal. It's unclear what remarks, if any, Diess made at the gathering in question. Diess didn't help with the case against Winterkorn, according to the people familiar with the matter. Prosecutors routinely use safe-passage letters with witnesses and subjects of investigations that allow travel for interviews or testimony. Lawyers for possible targets are sometimes allowed an opportunity to argue against prosecution ahead of any decision to bring charges. Prosecutors also sometimes give advance notice to those about to be charged if they're in the U.S. and not considered a flight risk, so they can turn themselves in rather than face public arrest. But it's unusual for prosecutors to allow a blanket safe-passage agreement, former prosecutors said. It's also rare to offer to give a heads-up about impending legal action to someone who may be outside the country and couldn't be extradited easily, these people said. One explanation for such an arrangement is that the Justice Department isn't finished investigating but has already determined that Diess is unlikely to be charged, said Michael Koenig, a formal federal prosecutor now at Hinckley Allen & Snyder LLP. "This is certainly a unique situation, and there are likely facts that the general public is not aware of that would allow for such an arrangement," Koenig said. Or, Diess may be providing useful information for the wider investigation, said Andrew Friedman, a white-collar defense lawyer at Shulman Rogers Gandal Pordy & Ecker PA. "I would anticipate there is some level of cooperation and some level of value this individual has," Friedman said. Among the eight individuals charged in the case, two have been brought to court. One executive, Oliver Schmidt, was arrested in Florida while vacationing there last year. Schmidt -- one of two employees who made presentations to Winterkorn, Diess and others at the July 2015 meeting -- didn't initially cooperate with investigators. He later pleaded guilty and was sentenced in December to seven years in prison. As for Winterkorn, Germany's Justice Ministry said on May 4 that the former CEO wouldn't be sent to the U.S. because the country refuses to extradite its citizens to countries outside the European Union. That means Winterkorn can't be arrested unless he leaves his home country.